Overwater bungalows surrounded by incredibly clear blue water. Tropical islands fringed by pure white beaches. Magnificent sunsets and incredible underwater encounters. All wrapped up in an ASTRONOMICAL price tag that would make even those with money to burn think twice. That’s always been our perception of the Maldives islands and resorts, and so we never really thought about what it would take to visit. But after ten fabulous weeks in Sri Lanka, the temptation to make a small diversion to another close-by tropical paradise before heading to the wintery UK and Canada was far too strong. So we started to research how we could travel to the Maldives on a budget and still have an awesome time enjoying all the incredible natural attractions that this teeny tiny country, scattered throughout the Indian ocean, has on offer. Wow, what a revelation. 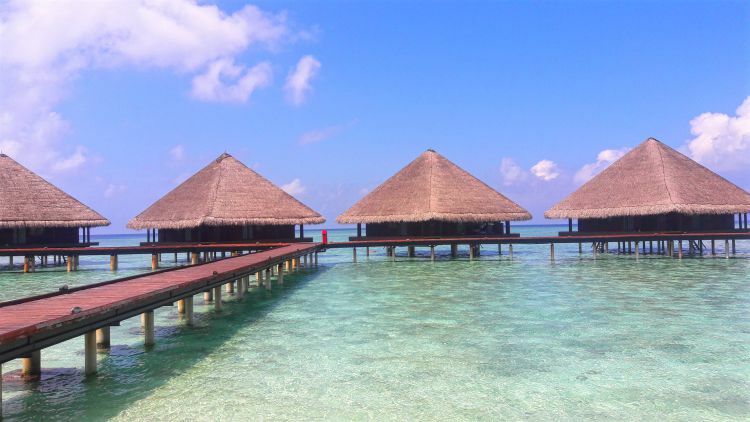 Things have changed a lot over the last few years in the Maldives tourism industry, and it’s not only possible just to visit the Maldives on a budget, but it’s also possible to sample some of the luxury resorts and activities in the Maldives at a fraction of the price. A public ferry service around the Maldives now travels to or around many of the island groups, meaning if you plan things well you can reduce your transport costs by A LOT! 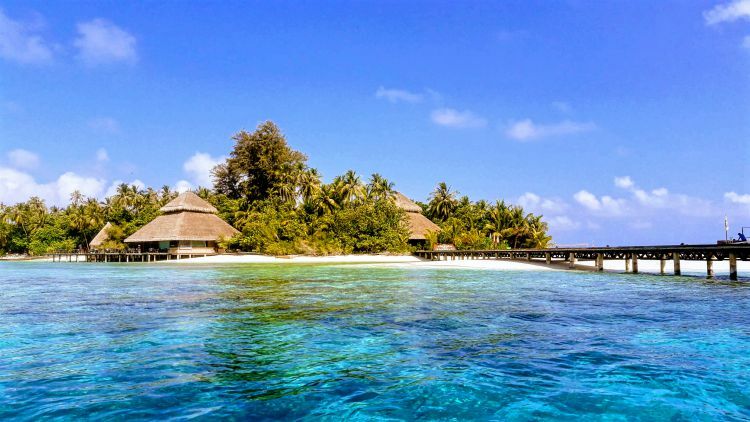 Local islands in the Maldives can now offer accommodation. Guesthouses have sprung up all over, and the prices are a fraction of the cost of the luxury resorts. Local islands all have a public beach and a “Bikini” beach. The bikini beach is where tourists can go to sunbathe and swim in their togs. Everywhere else, conservative dress is a must. If you stay on a local island in the Maldives, the guesthouse will often include breakfast and other meals, thus reducing your food costs compared with a swanky resort. Alternatively, you can eat at the local restaurants, or buy supplies at the local store. 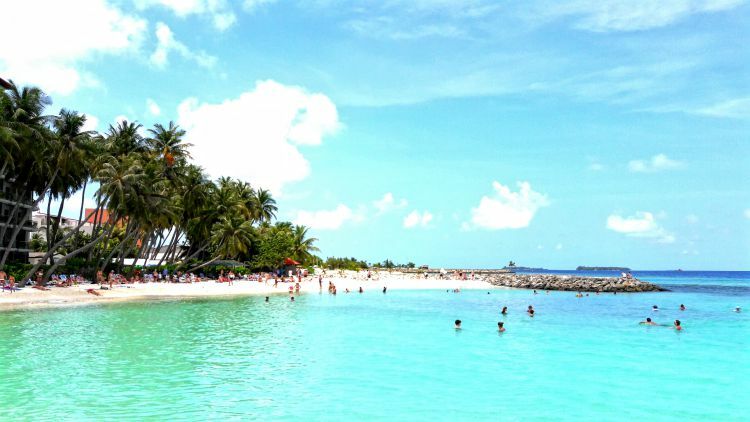 Local islands in the Maldives are alcohol-free. But there’s a couple of ways you can get a drink at somewhat reasonable prices. The critical choice you have to make is WHICH local island(s) to choose. After much deliberation, we decided on Maafushi for the following reasons. 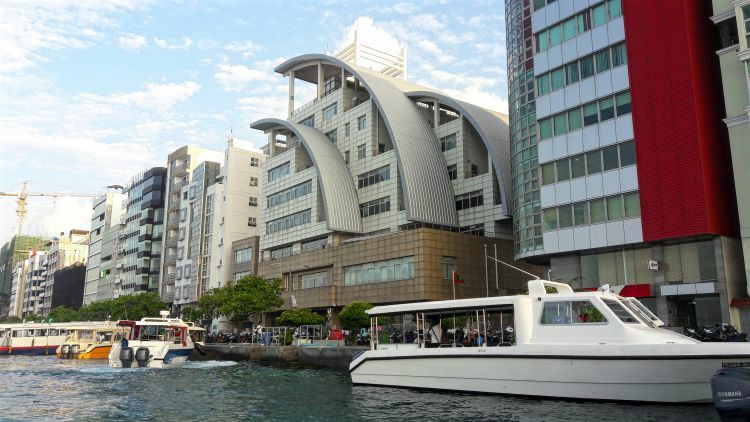 It’s connected by regular public ferries from Male. It was one of the first local islands to start catering to tourists so the infrastructure is quite mature and the locals are more used to tourists. The Maldives is a very conservative Muslim culture that doesn’t necessarily align too well with hedonistic holiday behaviour. Pictures of the “Bikini Beach” were pretty incredible and the reviews quite good compared to some other local islands. There’s a good selection of guesthouses with plenty of reviews so you can make an educated choice. There are a lot of tour operators on the island offering one of the most extensive selections of activities in the country and therefore competition to keep the prices reasonable. Handy Hint: It’s better to pay for most things in USD rather than convert your cash to the local Maldivian currency MDR as the guesthouses have to pay their taxes in USD and will, therefore, offer the sell rate when converting your bill. Change enough to pay for food and incidentals and take the rest as USD. Activities will all be priced in USD. Disclosure: If you do purchase a product or make a booking through some of the links or advertisements throughout this blog, we may earn a small commission. But hand on heart, it won’t cost YOU any extra, and it might just buy us a well-earned beer at some point. Day 1 – late flight into the International Airport on Hulhule Island. Ferry to Male (20 Maldivian Rufiyaa (MDR) = ~ $1.30). Brand new, extremely comfortable AC room in an Airbnb – $48. Brand new. Clean lines. AC, Wifi, Privat Bathroom Great Location 5 minutes walk from the ferry. This is a link to the Airbnb. If you haven’t got an Airbnb account yet, join through this link and we’ll give you a $40 credit to use on your first booking over around $100. One night here won’t do that but you can use it for future bookings. Day 2 – Buffet breakfast at Citron by LEmongrass with fabulous views(~$6.50 each) Look around Male – fish market, public beach, Tsunami Memorial. 2 pm check out. 3 pm, public ferry to Maafushi ($1.40). This city is way more modern and vibrant than we imagined. Lots of coffee shops and brand new sparkly buildings. Public Beach – Male, and yes that is a Gloria Jeans looking out over it. 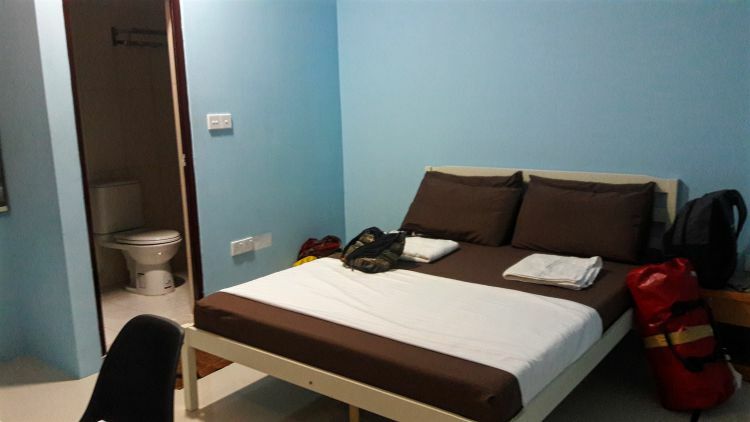 Accommodation – 6 nights at Alaka at Maafushi Guesthouse ~ $75/night for a superior double room including breakfast) The guesthouse is very popular and gets excellent reviews on all forums. The guys that run it are super helpful and run a comprehensive range of activities. And even if they don’t run a particular activity, they can help out with recommendations. Our room was clean and very comfortable with AC, fridge, safe, TV and private bathroom. Breakfast was a delicious buffet with a range of western, Asian and Maldivian choices. 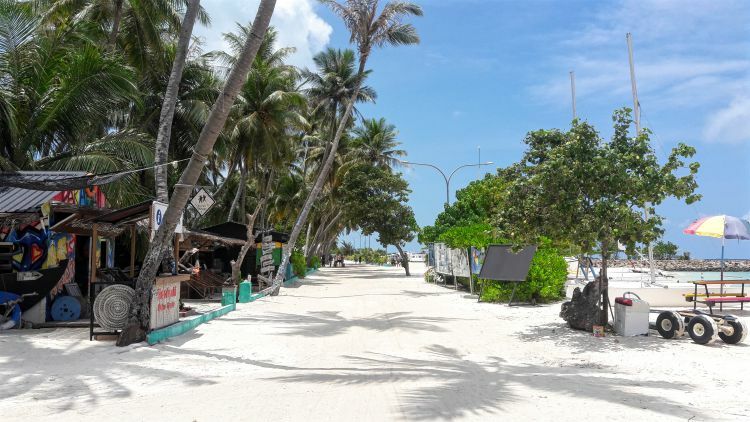 Day 3 – Explore Maafushi including Bikini beach. Incredible sunset views. Day 4 – Snorkelling off the public beach – Free (Alaka has equipment you can use). 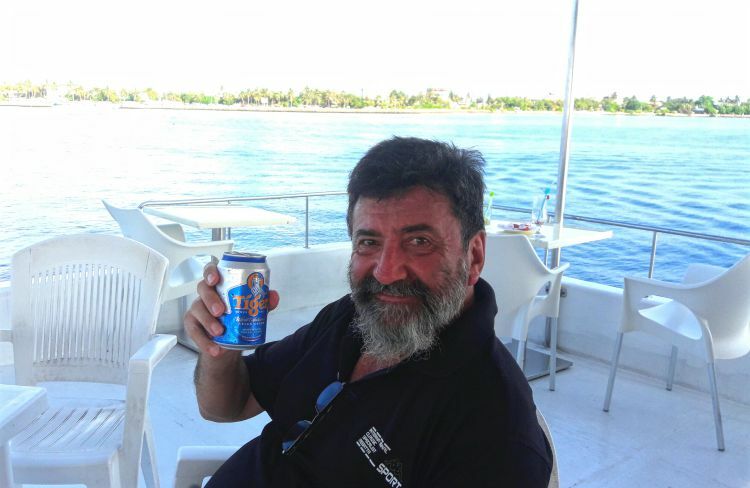 Evening trip out to the floating bar – FREE. Beers $6 each. Day 5 – Snorkelling trip run by Alaka at Maafushi guesthouse. An incredible variety of fish and other marine life plus a trip to the sandbar – $25 each. Hang out on Bikini Beach. Day 7 – Day trip to Adaaran Rannahli Resort https://www.adaaran.com/clubrannalhi/ – $100 each. All inclusive – transfers, incredible buffet lunch, and all day beer, wine and selected cocktails. Alaka will let you borrow their snorkelling equipment for the trip. We ate most of our meals at Alaka because the food was excellent and about 25% cheaper than most other restaurants on the island we checked out. Total Cost for Everything for 2 of us for 8 days – 7 nights = a bit less than $1000. Considering one night at a resort can cost between $300 and $3000 (and upwards!!) we thought we did pretty damn good. Don’t forget to buy suitable Travel Insurance for the activities you want to do while you’re there. Medical facilities on the islands are basic and Medical Evacuations are very expensive. We use WORLD Nomads as they are very competitive and cover popular activities such as diving, snorkelling, fishing etc. as part of their basic policy. It’s easy to add others if required. Check their website for a FREE quote HERE. The Maldives sits in the middle of the Indian Ocean, just under 800km from Sri Lanka, ~1700km from Mumbai, 3100 from Kuala Lumpur, and ~2700 km from Muscat. And way further from everywhere else. Taking a side trip to the Maldives from Sri Lanka, made a lot of sense. We would never get this close again. Initially, we were going to fly Colombo – Male- Muscat (Oman) – UK but I found by making a small adjustment to our route: Colombo-male-Colombo-Muscat we saved about $600!!!!! Handy Hint: Adding a week to your Sri Lankan itinerary is a fabulous idea and will reduce your transport costs a lot. The Sri Lankan tourist visa (30 days) is double entry, which is super convenient for this purpose. Otherwise, you can get a free transit visa for Sri Lanka – which allows you entry for two days. For such a tiny country, with a population less than 500K people, transport around the Maldives takes a little bit of forethought if you don’t want to spend a fortune on charter flights, expensive transfers or private speedboat rides. The Maldives consists of 1200 islands in 26 ring-shaped atolls, spread out over around 300 square kms. Only 200 are inhabited by locals, and another 120 or so have been turned into super expensive luxury resorts. The largest island, Gan, (247km south of the capital Male) is only 7.8 x 3.4 km, and most are way smaller than that. Choosing which island you visit will have a HUGE impact on your transport costs. Public (Government) Ferry – Public ferry routes are quite extensive and very reasonable with most journeys costing less than a couple of dollars at the most for closer islands (2-3 hours) and maybe $10 for those much further afield (5 hrs plus). BUT even the most popular routes are quite infrequent. 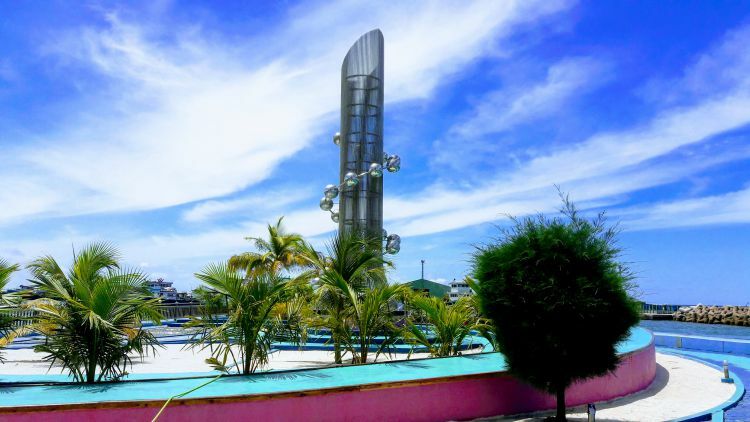 If you want to utilise this cheap transport option, you need to plan your arrival and departure dates and times otherwise you could find yourself spending a lot of time hanging around the capital, Male, rather enjoying yourself in a more exotic Maldivian location. Most of the ferries from Male operate from the Villingilli terminal in the southwest corner of the island. Private Ferries – a similar service but they also carry freight to the islands. Warning: some routes don’t operate on Fridays as it’s the holy day. Plan accordingly. Private Speedboat Transfers – Depending on your destination, these transfers can run into $100’s of dollars. Your accommodation usually arranges them. Flights – For the more far-flung atolls, the only practical way to get there is via a domestic or charter flight in a seaplane. Depending on how far you have to fly – Charter flights costs can be up to $450 return, although they may be included in your accommodation package. Yacht Transfers – If you’ve got money to burn you can get a private yacht transfer. Prices start at around $2000. But that covers up to 8 people. Here are some resources to start your transport and transfer planning. Alternatively, Choose a couple of islands you might like to visit and contact a few accommodation options and ask them about timetables. 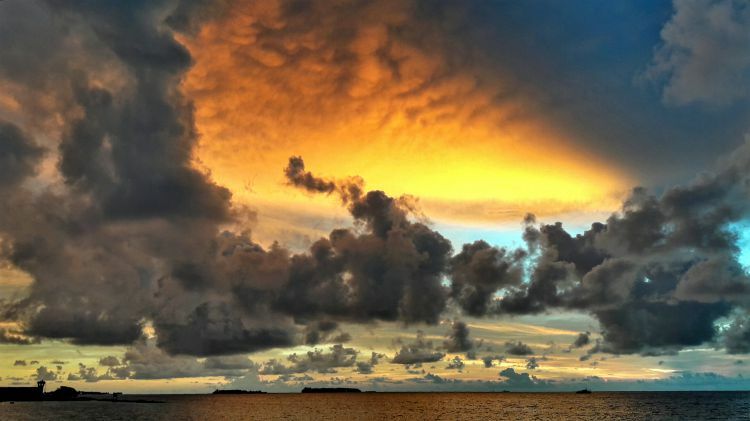 Maafushi Sunsets – never saw a bad one! Now that locals on the non-resort, inhabited islands are allowed to operate guesthouses, there’s a whole range of way more reasonable accommodation options available. Even the cheapest resort islands would totally blow our reasonable, but limited, travel budget. $300 is over three days budget, 5 or even more in more affordable destinations. We had no intention of spending too much time in our room. As long as it was clean, comfortable and we got a decent nights sleep, we’re happy. $300/night is a total waste on us. Everyone shares the same ocean. If you go on a snorkelling trip from a resort, you are likely to end up at the same place as a trip organised from one of the local islands. NOTE: The price on the booking engines does not include local taxes, and the cheaper options require you to pay when you get to the accommodation. Clarify the final price you’ll pay, so you have the cash. If you book with Booking.com here’s a ~$20 voucher to make your booking cheaper. CLICK HERE to get your voucher. Handy hint: Contact the guesthouse you choose directly and ask them their best price then compare it to what you’re getting on the booking engines before you hit the “reserve” button. Sometimes, but not always, you’ll get a better deal this way. They are not the cheapest on the island, but they are at the bottom of the price range. A superior double room costs just over USD70 per night (inc taxes) with breakfast. The rooms looked clean, comfortable and had AC, a private bathroom, a fridge and a safe. Everything turned out as advertised. They were very responsive on facebook with queries I had. They offer a range of activities. 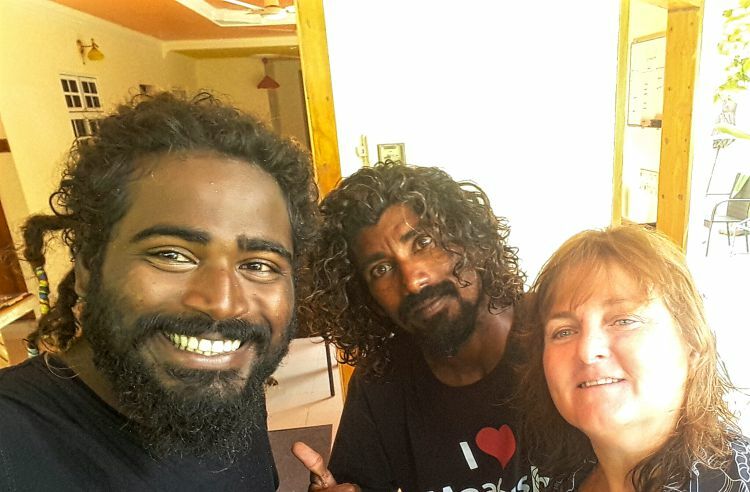 A couple of the friendly team at the Alaka at Maafushi guesthouse. Even though Alaka isn’t directly on the beach and is at the “local” end of the island which is at the opposite end to “Bikini Beach”, the guesthouse is less than 10 minutes walk and only 5 minutes to the ferry/boat dock where you’ll arrive and depart for all activities. The Alaka team will meet you at the ferry and carry your luggage back to the guesthouse and help you again when you leave. They have their own speedboat for activities and a good range of snorkelling gear you can borrow free of charge. The food is very reasonable compared to other restaurants on the island, and the chef is super friendly and obliging, as are the whole team. 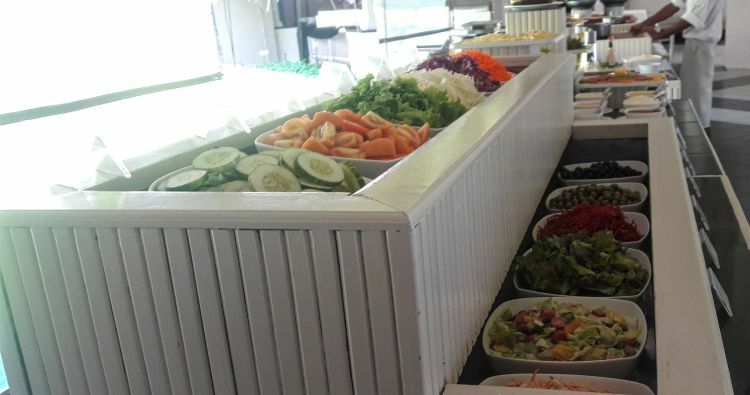 Most meals, including an entire fish, come in under USD 15 and there are loads of options well under 10. Our favourite was the tuna, chips and salad for two – USD 12!! I don’t think you can really complain about that. If you want to venture further afield, there are beachside restaurants offering buffet dinners for USD15 per head including seafood dishes. Pretty reasonable by international standards we thought. 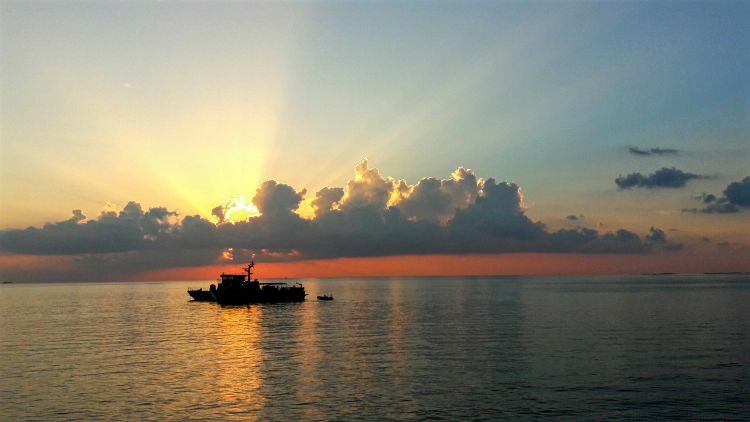 Sunset from the offshore bar – Maafushi. Courtesy appearance by the Maldivian Coastguard. Understandably, water-based activities are the main attraction in the Maldives. There is a good range of top quality Dive outfits in the Maldives. Maafushi has at least three schools I counted, possibly a couple more. While we were there, we spoke to several experienced divers and they all waxed lyrical about the quality of the dives they’d been on. While the coral was damaged quite significantly by the 2004 Tsunami, the marine life is still incredible. While we didn’t dive ourselves this time around, our snorkelling expeditions backed up their claims. Prices are reasonable with 10-dive packages at less than USD 400 including all gear. The people we talked to gave big wraps to Maafushi Passions Dive School. I couldn’t think of a more perfect place to do your diving certification. Snorkelling trips start at $20 and range up to around $50 for full day trips to see whale sharks. And yes they were in the area while we were there as we saw pictures. A range of boat trips to see dolphins, whale sharks, deserted sandbars and more. Not that big but it was very tasty. There is a range of fishing options available, but one of the most popular is the night fishing trips. $25 gets you a boat ride, all the equipment and assistance with setting your rig. 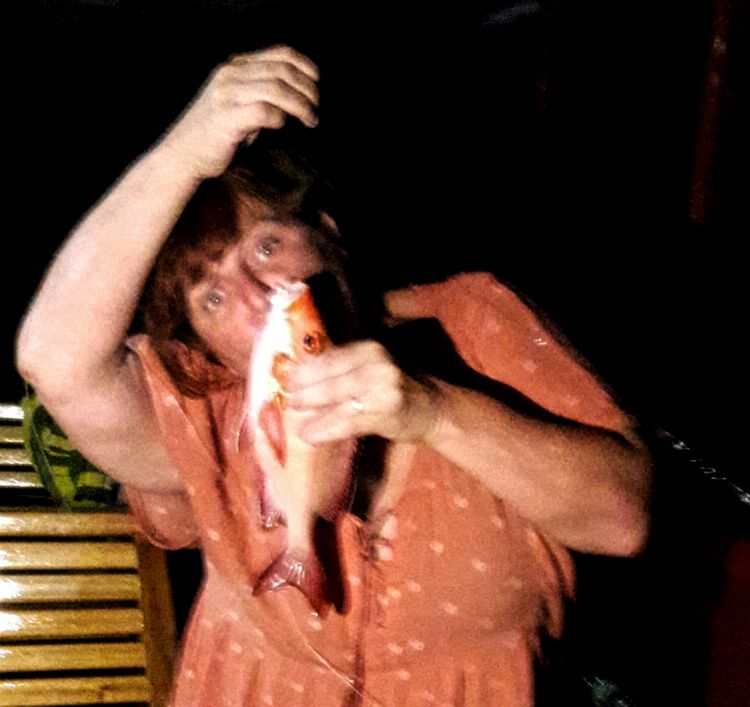 You’re almost guaranteed to catch something, and they then cook the catch and give you dinner included in the price. Stand Up Paddle Boards, Kayaks, windsurfing. I mentioned above that the local islands in the Maldives are alcohol-free. But a very enterprising resort has set up a floating bar on a luxury yacht about 300m offshore. You get the guys at the Harbour Cafe to call them up, and they send a speedboat to pick you up for FREE. Beers are USD 6 each (330ml), and cocktails are around USD 10. They also serve food if you want to have lunch or dinner. We ventured out twice for sunset drinks, and it was a very chilled out experience. No guilt pangs whatsoever. Tim looking very pleased with himself after a few days without beer! There are at least a dozen luxury resorts around Maafushi that you can visit for the day to get a taste of what’s on offer. All inclusive – transfers, lunch, and a range of beverages start from around $100. We had a Slovakian couple staying at Alaka who visited 5 of them during their stay. I worked it out that at USD200 a day, plus their accommodation at Alaka and their meals, they were still saving at least 30-50% off the price of staying on the resorts themselves, and they got to see them all, instead of being locked into one. So I waited until they had seen them all to give me their recommendation before I chose the Adaaran Rannahli Resort. The experience was incredible. I was whisked away by speedboat at 9 in the morning and deposited on the island. Once I was checked in and given my day visitors bracelet I was free to roam the island. The day included snacks for morning and afternoon tea, a full buffet lunch, and beverages, including alcohol all day (beer, wine, and selected cocktails). The buffet lunch was ENORMOUS and delicious. And I managed to sample every cocktail on the menu which ended up about 8 or 9 over the day…but who’s counting. The island has two bars, one near the reception area with gorgeous views of the incredible white sandy beach and blue, blue water. The other has a view of the overwater bungalows. Gorgeous. You’re basically left to your own devices. All the water-based activities you can do from Maafushi are also available here for a slightly dearer price. And I was offered 50% off their spa treatments as a day tripper. As mentioned above, just under USD 40 for a 60-minute massage. I didn’t do much except enjoy the scenery, eat and drink, so it didn’t cost me another cent. Highly recommended if you have 100 bucks to spare. Even though The Maldives has two seasons – wet and dry- the weather doesn’t change much all year around. The dry season runs between November and April. The wet season May to October. The prices are usually lower during this period. July and August are probably the primary months to avoid when the rain is the heaviest and tropical storms can impact on your transport options. 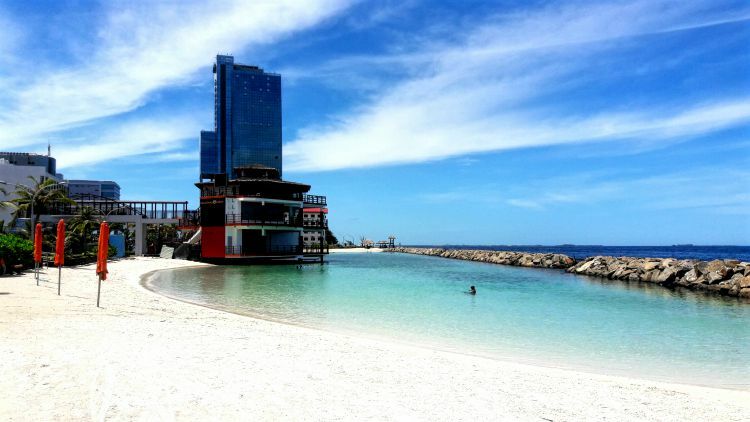 Conclusion – Is it possible to travel to the Maldives on a budget? If you have a budget that will barely cover your expenses in South East Asia – then no! 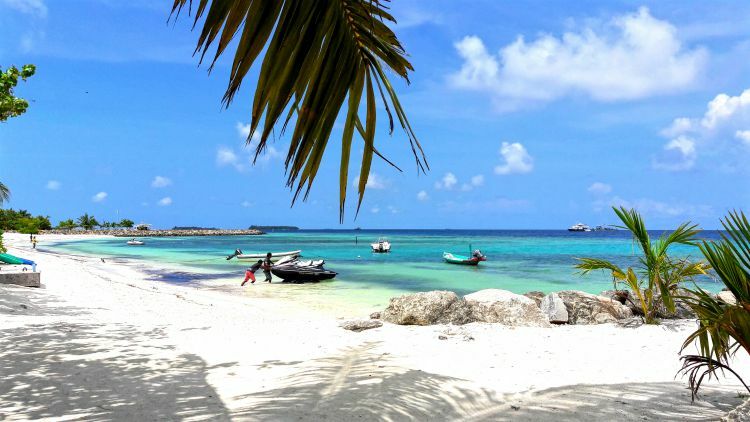 But if you have a bit of wiggle room, it’s absolutely possible to stay on an island in the Maldives and do a range of fun activities for less than USD120 per couple per day. No, you won’t be in an over-water bungalow on a private island. No, you won’t be able to drink alcohol any time you want. And I’m sure I’ve forgotten a few other benefits. The capital of the Maldives, Male, was way more modern than we thought. Would I go again….Mmmm? Probably not. It’s gorgeous. It’s incredible, and we did enjoy ourselves a lot. 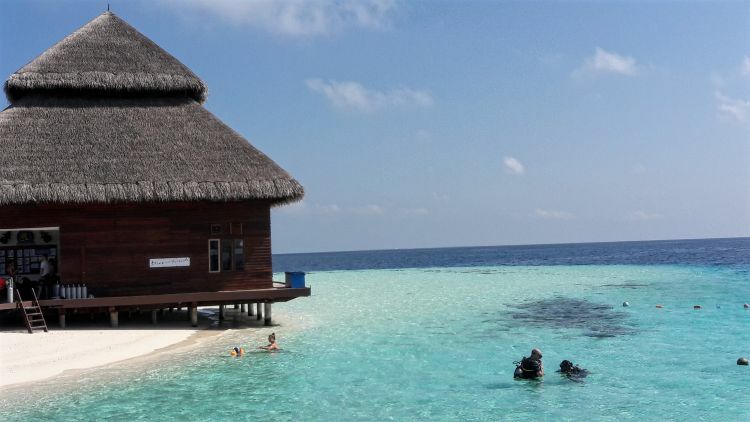 And, when we’re asked how much does it cost to go to the Maldives, we can at least give some personal advice based on our experience and research. But I don’t need to go again unless I was going to do a dive package. But I would absolutely recommend a visit if you do like the sun, sand, and ocean activities in an incredibly beautiful clean, safe environment. So have you been? What was your experience like? What haven’t I covered? What questions do you have? Let us know in the comments below. I read your article the other day and wanted to say “wow’! You did a great job of laying everything out, accompanied by great photos! I would have thought the Maldives was out of my reach due to costs, but you made me realize that with some good research and planning we CAN do it! Fab. I hope you get there one day. What a wonderful article, great information. I may need to push another pin in my travel map. The islands look stunning and the budget cost you’ve outlined is very reasonable. Glad I took the time to read. You’re welcome. When we realized we could do it on a budget, how could we not go. I hate to even admit this, but I had never even heard of the Maldives until the most recent season of The Bachelorette! 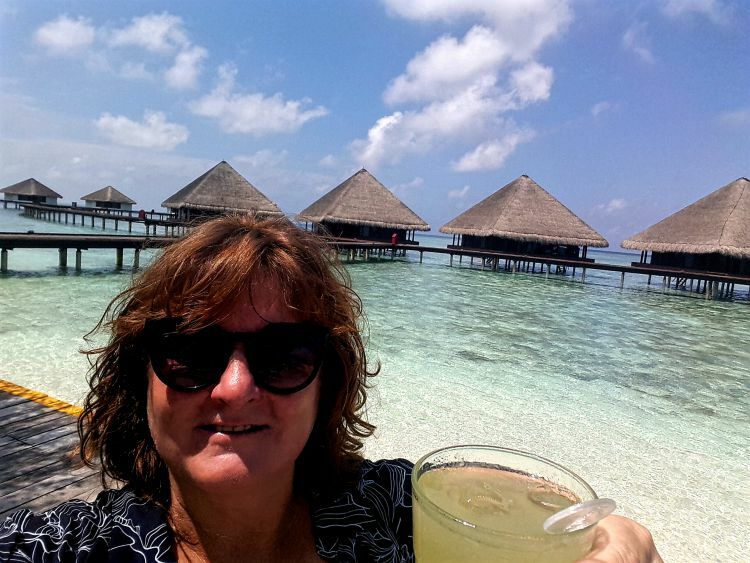 Thanks for sharing your trip and showing us the “real people” can experience this kind of tropical vacation! You’re more than welcome. Until we started researching we thought it was way out of our budget. And it tagged so well onto our Sri Lankan trip. Now that sounds like a great trip!! Thanks for all the great tips! You’re welcome. It was fun. Wow, this was so informative! Thanks for doing all that research. The Maldives are definitely I place I’d like to make it to one day. It looks so beautiful! It was beautiful. Being able to go out to the resorts for the day gave you all the luxury without the price tag. Looks like a fantastic trip!! I have always found that travel is not nearly as expensive as most people think! We totally agree. It helps to have great budgeting skills though, and really do your homework. Great article full of helpful info for planning a trip to the Maldives. Thank you Catch Our Travel Bug :). You’re welcom. Now to get finishing all our Sri Lankan blogs!